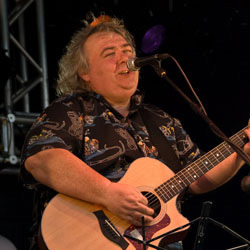 It was at Bristol’s Colston Hall in 2002 where Bernie Marsden bounded on stage with Deep Purple to rapturous applause. “Is that Ritchie Blackmore?” the twonk beside me shouted in my ear. “No, it’s Bernie Marsden!” I shouted back. “Is it?” The guy looked at me, looked at the stage, turned back to me and said, “nah, that’s not Bernie Marsden.” Given that I believe the death penalty should be re-introduced for people who talk at gigs (and people who make Meat Loaf records) this exchange of yes-it-is-no-it-isn’t continued for a short while until I told my new-found friend to go forth and multiply. But after the show I reflected that the ‘discussion’ probably sums up Bernie Marsden perfectly. Everyone knows who he is, but perhaps a lot less people actually, well, know who he is. The recent re-issue of his two early solo albums ‘And About Time Too’ and Look At Me Now’ (both on Cherry Red’s Hear No Evil imprint) might go some way to rectifying this. Marsden’s first professional band was UFO, which he joined in November 1972. “It was a straight audition,” he recalls, “from an advertisement in Melody Maker. I was in a local band, looking for that kind of pro outlet. We tried it ourselves, like every other local band; you think the band can make it on its own but it doesn’t happen. The other guys were great; they’d already told me ‘you’re out of our league,’ that sort of thing, ‘you’ll make a good pro’ and all that. And I thought ‘I don’t really know what they mean!’” he laughs at the memory. “We went to see, I think it was Chicken Shack, one night, and I said ‘isn’t Stan Webb a great guitar player?’ and they said ‘yeah, he’s very good, but you’re better than him,’ and coming from my friends that was a bit of a shock! To this day I don’t think I’m better than anybody, to be honest, but the fact that my friends said that… Normally your friends knock you down, don’t they – ‘one of these days you’ll be as good as him’ sort of thing! – but they were quite genuine, and whether I was better than him or not is unimportant; the important thing was that it made me think that I could be a pro. So after that I did apply for a few jobs, did a few auditions, and I got the job with two or three people but didn’t want to do the gig because in those days they used to advertise ‘name band wants lead guitarist’, or singer, or whatever, but they never said who they were. So you’d go for the audition and they’d tell you who they were and it’s like, ‘well, I don’t really want to play folk music’; or they’d say ‘we’d like to offer you the position’ and I’d say ‘well, who are you?’” he laughs again. “The UFO thing was different. They were quite upfront about it and I was lucky enough – or unlucky enough! – to be considered the best candidate, and that’s how I started. Forty years ago! Marsden’s audition obviously went well. “Playing with Jon and Ian was like having more people of Cozy’s stature around you, and you realise that you’re all raising the level of everyone else’s playing abilities. And then the irrepressible Tony Ashton wandered into the room and I instantly felt I had an understanding with him. I just loved him to bits. Looking back on it now I was surprised how ‘unnervous’ I was about it. Playing with Cozy had given me a hell of a lot of confidence and he’d encouraged me very much as a writer and that’s what Jon and Ian were interested in for the project: they needed a good guitar player and they needed a good solid writer who could sing a bit as well. The moment Jon said, ‘well, I think we’ve found our man, Ian’, that kind of thing, that gave me another three or four steps up confidence-wise, and they both made me feel very welcome. You were part of a team very quickly, so I wasn’t really nervous around them at all. And, well, I didn’t realise how famous they were in a way because I was never a huge Deep Purple fan. If I’d have been a Ritchie Blackmore acolyte I would have been very, very nervous. Jon said to me at the audition, ‘do you know any Deep Purple songs?’ And I thought, ‘oh no, here goes the gig.’ I said, ‘no, I don’t really. I only know ‘Dance On The Water’.’ He said, ‘I think you mean ‘Smoke On The Water’.’ And I said, ‘well, yes, but I only know the riff,’ to which he replied, ‘everybody in the world, my dear boy, knows the riff’!” Marsden laughs again. “I thought that might lose me the gig, but in fact it might have been one of the things that got me the gig because I was so far away from what Ritchie was doing. I mean, Ritchie’s great, don’t get me wrong, but as a guitar player I don’t come from that direction. “Paice Ashton Lord,” he continues, “was a great band. It didn’t really do much but musically it was one of the best things I’ve ever done.” It was also the final link in the chain that led Marsden to cross paths with David Coverdale. “We were recording the PAL album in Munich, in a very famous studio that’s sadly gone now called Musicland where ELO and Queen did everything – that was a great place to work, great vibe – and David was living about an hour from Munich in those days with his first wife who was a German lady, a lovely girl, and he came to see Jon and Ian on a social and that’s where we met. We talked about music and what we’re into, but of course he didn’t know much about me and I didn’t know that much about him either. I knew he was a good singer because back in Hammer days in 1974 Cozy had played ‘Burn’ to me from a white label. He wouldn’t tell me who it was because he knew how prejudiced I was; he’d have said ‘have a listen to this new Deep Purple album,’ and I’d have replied, ‘no, I don’t like it’! So he played me this white label and because I didn’t recognise the voice because David was brand new to the band, when he said ‘that’s the new Deep Purple’ I replied, ‘no; can’t be! Who’s that singing?’ ‘Oh, that’s the new kid,’ Cozy told me. So I told David that story and made him laugh. We had a bit in common in that he’d been the new boy in Deep Purple and I was the new boy in Paice Ashton Lord, and also new to the Purple organisation which was quite big. And we got on really well. But that’s how we first met. As noted elsewhere in the review Marsden’s first solo album ‘And About Time Too’ was recorded at Central Recorders Studios (where Whitesnake had done the ‘Snakebite’ EP and ‘Trouble’ album) in July/August 1979, almost immediately after their second album ‘Lovehunter’ had been completed. It was originally recorded for the Japanese market where Marsden had, quite unexpectedly, become a guitar hero. “I think we’d done two Japanese trips and the Japanese… Well, it must have been a good time for me to be there because when they started voting for their favourite musicians in guitar magazines and music magazines out of nowhere I ended up in the Top Ten in three magazines. All my heroes were at No.1 – Eric Clapton, Brian May, Ritchie Blackmore – and I’m at No.6 or so from absolutely nowhere. And so a Japanese record company came and offered me a solo deal and that’s how ‘And About Time Too’ started. It was only originally commissioned for Japan. All I wanted to be was the guitarist in Whitesnake; I never had any illusions of a great solo career. But the record then sold on import for something like £10, a lot of money back in ’79/’80, so Parlophone picked up the option to release it here and then they wanted another one very quickly on the back of it. That’s why the UK ‘And About Time Too’ and ‘Look At Me Now’ were released very close to each other; I think they were only about three or four months apart. I had to record ‘Look At Me Now’ quickly because we had less time – we had a month, or maybe a three week break – and Parlophone said ‘could you get into the studio? We need another album.’ They thought it would chart. They claimed that if all the imports of ‘…About Time Too’ had counted that one would have charted. I remember thinking at the time, ‘well, I don’t know about that that’! “The whole thing was 100% positive and the whole process was excellent from start to finish. ‘And About Time Too’, the title, was a play on words because a lot of people had been saying that the last Babe Ruth album was a solo album in disguise. I mean it wasn’t, but it did have a lot of my songs on there and I do sing some stuff on there, but somebody near me – in my family I think – somebody near me heard I was making a record myself and said ‘and about bloody time too!’ because I’d been saying I was going to make a solo record all my career and finally I did. The cover shot was real, it was a local place where I grew up, and I just love the new shots that they found for the cover of the re-issue – seeing some of those shots does bring back really good memories. “Having Jack Bruce on the album was fantastic – that was literally a dream that did come true. That again was thanks to Cozy. I’d done a track for Cozy’s album with Jack playing – me, Jack and Cozy in the studio playing and I’m pinching myself for about an hour – and I said to Cozy that I’d love to have Jack playing on a couple of tracks on my album. And Cozy being Cozy said ‘well, why don’t you just ask him instead of talking to me about it.’ He gave me his number and said ‘call him’! So Jack came down and we did the record, and it was great to have Jack playing alongside Ian Paice – that’s a rhythm section that had never been done before, and it just all came together really well. It was really good. Jack is just astonishing. And then you’ve got Jon Lord thrown into the mix, Simon Phillips… Loads of drummers bought that album because you had Cozy Powell, Ian Paice, Simon Phillips, all on the same record. I always said at the time, tongue-in-cheek, that I was the most unknown person on the album and looking at it now it was true!” he laughs. As noted earlier, by the time ‘And About Time Too’ was given a UK release in May 1981, ‘Look At Me Now’ had already been recorded. I wondered about the title track, another nice play on words, and pointed out that I’ve always thought there was a sadness to it, perhaps a play on a loss of the guitarist’s privacy. “I know what you mean,” he agrees, “I wish I was that deep, really!” Another laugh! “I always said that I should have probably pushed it so that ‘Look At Me Now’ became a Whitesnake track. The album’s a lot rockier than the first one and I just think ‘Look At Me Now’, well, I’d love to have heard David singing that. But yes,” he starts to sing, “‘Look At Me Now, I’m all alone, look at me now, a rolling stone’, I know what you mean. Sometimes I get to think that I was a bit young to have been singing like that back then – nowadays it’s OK though!